I’ve read and heard many stories about the Lubavitcher Rebbe, of blessed memory, for years. The way he looked into your soul, how he was able to give advice in various languages, how he would spend hours and hours through the night as visitors from all over the world came to seek his counsel. I never met him, never spent time standing in a room with him, or watched him speak in front of large crowds of people. But still, this man I never met has irreversibly changed my life, the lives of my husband and our children, and, I would imagine, generations to come. How could it be, that this humble man who spent most of his life in a tiny enclave of Brooklyn, called Crown Heights, could elevate my soul and change my life’s direction here, where I was born and raised? I remember being fascinated by the simplicity and timeliness behind what we were learningBut it happened. It all started eight years ago with a Torah class at Chabad of Pinellas County in Palm Harbor, a couple of years into our marriage and before we had children. I had met Rabbi Shalom Adler when I worked as a reporter for the local Jewish newspaper. Sitting across from him in his small synagogue office, I noticed his beard, the holy books surrounding him. He told me about the class, called Soul Power, through the Jewish Learning Institute. My husband and I went to the synagogue one night a week, and I remember being fascinated by the simplicity and timeliness behind what we were learning. The rabbi invited us to a Shabbat meal, and we met his wife Chanie and their children. We considered going to Shabbat services there, but it didn’t happen, at least not then. We moved to another house, further away. A few years later, after having our first two children, it was the High Holidays and we needed a place to go. We found another local Chabad, and since they weren’t charging for tickets, we tried it. We were a little apprehensive at first, but our uneasiness quickly subsided, despite the newness of the situation and the rituals surrounding us. Somehow, the warmth of the people there was enough to put us at ease. Soon after, we met at a Federation meeting yet another Chabad rabbi and rebbetzin, and that was the clincher. During a Shabbat meal at the home of Rabbi Yossi and Dina Eber of Chabad of West Pasco, a large framed picture of the Rebbe peered down at us, lovingly, from the wall. I was a little taken aback at first. But the meal was almost indescribable—warm challah and wine, salads and fish, chicken and kugel. Prayers and songs and giggly children. The more I got to know them, the more I realized this was something I wanted more of. This was a rich life, filled with meaning and direction, inspiration and wholesomeness. But what was with the picture of the Rebbe? Who was he? In the years that have followed, we have decided to slowly take on the commandments we have been learning about, seeing and experiencing. It started slow, lighting Shabbat candles, baking challah, saying kiddush. Giving up non-kosher food. We fumbled through the prayers and the details in the beginning. But it’s becoming like second nature now and my husband and I both have learning partners on the phone which has been an easy way to continue learning. After a few pit stops, we moved to Palm Harbor, in walking distance of Rabbi Adler’s synagogue. We are now completely Torah observant, keeping Shabbat, adhering to all dietary restrictions, and in every other way. I’m told we look like we’ve been doing this all our lives. A beautifully framed picture of the Rebbe—a gift from a friend—now hangs on the wall in our living room, atop the shelves holding the expanding collection of holy and inspirational books that now make up our library. What was with the picture of the Rebbe? Who was he? His picture is a source of inspiration for me and reminds me to be a better person, a better mother and a better Jew. 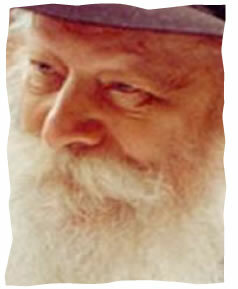 The Rebbe with his gentle eyes helps keep me going forward. Over the years, we have learned that there are thousands of Chabad rabbis like ours all around the world. The Rebbe sent them out to serve as beacons of light, to share warmth and Judaism, to invite people like us for meals and classes. And it’s working. There are thousands and thousands of people all over the world embracing their Judaism. There are blogs and websites and books filled with their stories, and even whole communities sprouting up and thriving because of these passionate baalei teshuvahs, those who reconnected to their Judaism later in life. I love to meet people and hear stories of how they reconnected with their Judaism. Almost inevitably, it leads back to a humble Chabad rabbi and rebbetzin, inspired by the Rebbe. My husband and I are back here, where we were raised, living a richly Jewish life. Our young children go to a traditional Jewish school, and already know much more than we do. I smile big and broad as I listen to them confidently singing the Hebrew prayers, reading Hebrew, and teaching us the details of the various mitzvahs. For the first time in my life, I know the true meaning of the word nachas, joy. The love and pride I am experiencing, the true connection to our past and to G‑d, are almost indescribable. We occasionally visit other, larger communities, and draw inspiration and practical guidance. We bring a little of it back here with us, drawing more strength from local classes and our study partners. We have started inviting guests for Shabbat meals, and continue to grow. This is where we got our foundation. Our roots are here, our families are here. I don’t know what the future holds for us, if we’ll end up moving to an area with a larger concentration of Jewish families, a place that offers more options for schools and kosher restaurants and friends. For now, we try to learn a little every day, to grow as parents and as people, and maybe even to share some of the light and love we’ve experienced. As the Rebbe taught, that can be done at any time, by anyone, anywhere in the world. Author Postcript: Since writing this article several months ago, and after much thought, prayer and research, my family and I moved to the Toco Hills area of Atlanta. The community offers a growing, vibrant mix of observant Jewish families (including many others who became Torah observant later in life), along with excellent schools and yeshivahs, as well as kosher restaurants. We celebrated the High Holidays here, which gave us a great chance to experience the warmth of the community and to be fully immersed in the beauty and richness of Jewish life. Mindy Rubenstein is a freelance journalist who lives in Florida with her husband and children. She also serves as the publisher/editor of Nishei, a magazine for Jewish women. What Is a Baal Teshuvah? What an amazing article! Mindy, you did it again! Reading through your article, I felt as you were talking to me. Your article is so full of light and love, I could truly feel every emotion that you described. It's just so real! Me and my husband also have never met the Rebbe. But as my husband became religious through his Chabad Rabbi, he took all the love that this Rabbi and his family gave him and shared it with me. This is how our young family was able to move from all-mighty NY to little Palm Harbor. That love and connection to the Rebbe, his teaching and sichot, were the reason we survived there (religiously and physochologically) for so many years. And you, Mindy, already share the light and love through your beautiful writing! travelers in the country known as LOVE I see great beauty in this story, and I perceive in all stories that do become stories of lost and found, of roots and identity, whether they are Jewish or come from another religious or spiritual perspective, to be quite beautiful. I think we're here in diversity for the "trade routes" we travel, and that we need to carry with us our identity cards but be ready to empathize with the journey others take, too, which might not be our own journey, but equally compelling. To Johnny It is truly an inspiring article. As for you...you don't have to become Jewish in order to give up Xianity. You can become a Noachide and keep the 7 mitzvos for the 70, and fulfill your G-d given purpose in the world. There are many resources on the web to help you. from her heart and soul when she tells the story of how she and her family became Torah oberservant through the Rebbe and his emissaries.